Welcome to New Zealand’s emptiest region. Not many people in NZ call the West Coast “home” but there are plenty of reasons to visit. Despite the 600km of coast getting a lot of rain, it creates some luxuriant rainforest and lakes. In fact, the region is so stunning that it incorporates five national parks and one World Heritage Site! Even the drive down the State Highway 6 road a.k.a. the Great Coast Road is very enjoyable, so be sure to take some stops along the way to take it all in. If you want to read more on the world’s most accessible glaciers, which are on the West Coast, visit: Glacier Country – Guide for Backpackers. Raft the Buller Gorge and see the Pink Granite Canyon. Make some stops between Westport and Greymouth at the Punakaiki pancake rocks, a seal colony, and go black water rafting! Take the totally scenic TranzAlpine train from Greymouth through the Southern Alps. Stock up on sunset photos at Hokitika. 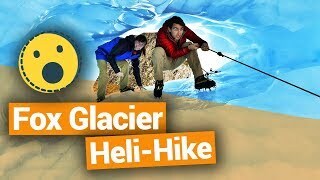 Climb a glacier in the Glacier Country. Witness brilliantly blue pools at Haast. Westport is a great base for when you are taking on West Coast activities. You will not be disappointed as there is – take a deep breath – white water rafting, kayaking, jet boating, glowworm caves, abseiling, quad biking, horse trekking, seal spotting, mountain biking, and surfing… Phew! White water rafting on the Buller Gorge offers a unique take on rafting with a change of pace between slow pools to enjoy the views and taking on adrenaline-boosting rapids. Plus, you get the opportunity to raft through the unique Pink Granite Canyon. Pretty! Take advantage of the surrounding mountain biking and hiking day trip in the area, such as the Charming Creek Walkway, Denniston Plateau, and more! Check out Westport – Guide for Backpackers for a complete guide on things to do in Westport. Few people travel to the very north of the West Coast but with natural wonders of the Oparara Basin in the Kahurangi National Park and the New Zealand Great Walk, the Heaphy Track, it is well worth getting off the beaten track. If hiking in some of the most wild rainforest scenery in the country mixed with the charms of a slightly hippyish town, the Karamea is for you! The hostel in town is an attraction in itself with it’s rainbow paintwork and it’s very own radio station. Karamea is the gateway to the Kahurangi National Park, including one end of the Heaphy Track. This 4-day journey starting on the Karamea side takes you through nikau palm tree groves along the rugged coastline. Either do the whole track or simple return the same way to complete a day walk. The Kahurangi National Park also holds the many caves and arches of the Oparara Basin. 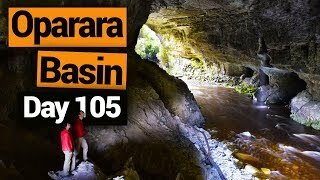 Many short walks from the Oparara Car Park (a single gravel road not suitable for motorhomes) take you to the likes of the grand Oparara Arch (25 minutes one way), Moria Gate Arch (30 minutes one way), Mirror Tarn (10 minutes one way), Crazy Paving & Box Canyon Caves (5 minutes one way), and much more! One of the very few inland towns of the West Coast, Reefton has a fascinating history of its own. Visit the first town in the Southern Hemisphere to have electricity distributed to the public! Aside from history, Reefton is often referred to as the “Mountain Biking Capital of New Zealand”. The amount of mountain biking tracks is extensive, and is best explained in our Mountain Biking in Reefton. Reefton also has a significant gold mining history where many relics of those days feature on the surrounding hiking and biking tracks. Hire a gold pan from the sports shop (the only one in town) and go panning for gold! The rivers are super popular with fishermen too, so join a local for trout fishing! We’ve outlined some more stuff to do in 15 Awesome Things to Do in Reefton. On the Great Coast Road between West Port and Greymouth, stop off at Cape Foulwind to see the seal colony sunbathing on the rocks. There is a viewing platform, so pictures are easy to take without disturbing the seals. Plus, you can see how far you are away from home on the international cities sign. [Update: sign has been taken down]. Go black water rafting, yes, you read that correctly. There is a South Island option for black water rafting – Waitomo is no the only one! With Nile River black water rafting, you leave from Charleston, 26km from Westport, and you will be taken by a rainforest train to this caving experience including abseiling. Be sure to stop off at the Punakaiki pancake rocks and blow holes on the Coast Road. Try to time your visit with a high tide for a better blow hole show. Either way, the crazy rock formation, from millions of years of compression, looks like stacked pancakes. 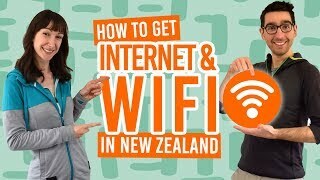 It is a must for the New Zealand photo album. Whilst in the area, do the Truman Track walk, which is only a 30min walk into the rainforest to one of the most romantic hidden beaches in New Zealand. [Update: Also check out the brand new Paparoa Track – a New Zealand Great Walk in the Paparoa National Park near Punakaiki]. From Greymouth, you can take one of the most scenic train journeys of your life! Go through 19 tunnels in the Southern Alps on this 4.5 hour TranzAlpine journey. This is the direct route to get to Christchurch daily. Other than dreamy mountain views, see the Waimakariri River gorges, vast valleys and the Canterbury Plains. For more information, see our article on The Train Network in New Zealand. Beer guzzlers, be sure to check out Monteith’s Brewery. There is a brewery tour and a cafe to taste 7 different beers. 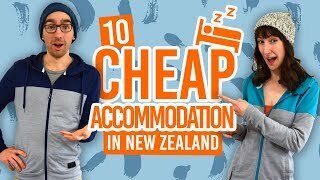 For more awesome things to do in Greymouth, check out Greymouth – Guide for Backpackers. 35km east of Greymouth, you will come across Lake Brunner and the town of Moana. This area is peaceful with great trout fishing. Here, you can get some stunning views of the Southern Alps, especially if you go hiking. Carew Falls walk goes to the top of the waterfall. Sit on top of the granite boulder for an awesome lookout over Lake Brunner. Another walk to try is Point Elizabeth walkway. It is a 3-hour coastal walk through native bush and on top of cliffs. In fact, there are so many awesome walks in the area, we wrote them down in 10 Hikes Around Lake Brunner. We also recommend a trip out on the water with the only boat operator in town. The dark lake looks glorious in all weather! Who doesn’t like to see the pretty lights of glowworms? The Hokitika Glowworm Dell is a free 5min walk just opposite the Shining Star Beachfront Accommodation. Obviously, visit at dusk or night time. Want to take an awesome sunset picture? Hokitika Beach is scattered with driftwood so you can get creative with photographs of this wild beach. As if the town knew how much backpackers love taking photos of sunsets, there is actually a Sunset Point at the end of the Hokitika River. [Update: Sunset Point has unfortunately been washed away]. Whatever time of day, it is worth walking along the Hokitika Gorge with its milky blue and green pools, granite rock gorges and rimu forests. Further along the river is the swingbridge where you can get to the very edge of the gorge itself. In fact, the water looks so good, we wouldn’t blame you for jumping in! Take in the views of the Southern Alps, Lake Mahinapua and the Tasman Sea from the Treetop Walkway. Follow the elevated path around the treetops, much like the name suggests. For more things to do in Hokitika, check out 6 Reasons Why Hokitika is Such a “Cool Little Town” and 23 Unforgettable Walks in Hokitika. On the second Saturday of March, Hokitika hosts the annual Wildfoods Festival. It certainly is weird entertainment for the adventurous eater. Read more about it here: 6 Summer Festivals in New Zealand. Explore New Zealand’s most famous glaciers: Franz Josef and Fox Glacier. You can do hike on and in the ice or skydive overhead. There is so many ways to explore this region and see this rapidly retreating attraction, from kayaking to skydiving! We love it so much, we have a whole other guide dedicated to it. Take a look at: Glacier Country – Guide for Backpackers. Also check out 7 Ways to Take on New Zealand’s Glaciers. Leaving the West Coast? Don’t leave without seeing the brilliantly Blue Pools. The road offers many incredible lookouts, stops and walks to multiple waterfalls, including Thunder Creek Falls and Fantail Falls. The gem of the bunch is a short drive from Makaroa, where you can discover turquoise pools so clear that you can see the bottom of the river. Unmissable, people, unmissable! Find out more why Haast is a must-visit place in 10 Reasons Why Haast Has World Heritage Status. Head to Jackson Bay for its lakes and mountain views. See the 3-eyed lizard (Tuatara) at the National Kiwi Centre, Hokitika. Buy a greenstone souvenir necklace for a friend (because there’s heaps around here). 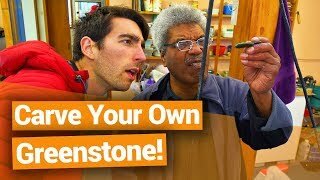 Make your own knife in Barrytown, because you are wild. They don’t call it the “Wild West Coast” for nothing. Get a surfboard and go! We know some decent beaches here: 5 Places to Spot a Surf in the South Island. Where to stay on the West Coast?